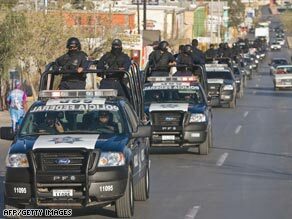 Mexican federal police patrol in Ciudad Juarez earlier this week. If you drive into El Paso Texas on Interstate 10 from the west and look to your left, you will see a neat cluster of Tibetan inspired buildings that make up the University of Texas at El Paso. Look right and you will see a seemingly endless shantytown sitting on top of rugged desert hills, smoke plumes rising in the air. If you weren’t familiar with the area, you may not even know that you were driving between two countries and two cities. Two cities so far apart and so close together. El Paso is one of the safest cities in the United States. Ciudad Juarez is now one of the most dangerous places on earth. When I think of Juarez, I don’t think of an ultra violent city. I understand what it has become, that’s just not the way I remember it. I grew up in El Paso. My parents still live there. As a child, my father emigrated from a small town in the state of Chihuahua a few hours south of Juarez. My mother has relatives who live in the city. For generations, geography, economy and family have interlinked Juarez and El Paso. As a young boy I had mixed emotions about Juarez. I remember our weekly treks over the border to visit relatives. Every Sunday the routine was church, breakfast at my parents’ favorite restaurant, visits to my great grandmother's house and occasionally, a haircut at my father's favorite barbershop. A place that smelled like hair tonic and aftershave, where they still used hot towels and straight razors to clean a man’s face. I enjoyed visiting my family’s glass factory, where they hand crafted beautiful vases and figurines. I loved watching the artisans pulling out molten glass from the ovens and shaping it. And I enjoyed the color and commotion of the main downtown market. But, at the time, I mostly thought of Juarez as a dirty, boring, backwater. A reminder of my family's humble past. I felt like I had nothing in common with my cousins there. During most visits, all I wanted to do was escape. To return to my comfortable American existence a few miles away. It sounds crazy coming from a Mexican American, but I just couldn’t relate to the culture. By the time I was 16, I developed a much greater appreciation for all that Juarez had to offer. Like many El Paso teenagers in the 1980s, I spent many a weekend night on “The Strip” in downtown Juarez. It was sooo easy. Five dollars to park, a quick walk across the Paso Del Norte Bridge and you were on teenage Pleasure Island. Pumping music, dancing, cheap booze, good food, girls! Every Friday and Saturday the clubs on Avenida De Juarez were packed with kids from El Paso area high schools. White kids, Hispanic kids, black kids. Rich kids, working class kids. Kids whose parents had no clue their innocent little babies were stumbling around drunk in a Juarez alley at 3am on a Saturday morning. We would rock out to The Cure and New Order at clubs like The Copa, Alive, The Sub, The Superior. Soldiers from Ft. Bliss would hang out at Spankys or Cosmos. My school, Eastwood High, practically had its own nightclub, The Tequila Derby. On some nights the Derby had a promotion called “Drink and Drown”. Five dollars cover charge, all you can drink. Seriously. I mean I was in high school. By the time I was a freshman in college I was spent. My favorite hang out was a bar called The Kentucky Club, a classic western dive trapped in the 1930s. It is one of the many places that claim to have invented the margarita and once inside, it is like walking into a movie set. Bob Dylan, Jack Kerouac and Marylyn Monroe drank there. My interest in the Kentucky was that my hero, Steve McQueen, used to hang out there. The bar was well kept with rich hard wood and polished brass. Old gentleman waiters wore proper white aprons and the tables had actual linen. The bar was so old that the plumbing was a trough that drained melted ice and God knows what else, under the foot rail and into the street. You could buy real Cuban cigars. It made me feel mature and sophisticated to have a drink there. Of course even then, Juarez had an edge. Besides the underage drinking, that edginess was part of the attraction to a teenager. But, if you weren’t careful, you could get into terrible trouble. My friends and I always stuck together. Girlfriends never strayed away even if they were pissed at you. The police kept a ruthless watch over us. If you got out of line just a little, got into a fight or walked out of a club with a drink, you might end up in a paddywagon until your friends collected enough “bail” money to spring you. A friend once got beat up and had his shoes stolen in one of those portable drunk tanks. We almost never strayed off the avenue. One night, my senior year, I got into a Juarez taxi with my friends Eric and Scott. We wanted to go to an off avenue club we had heard about. Something got lost in translation and the driver took us to a brothel out in the desert! These days it’s just too dangerous for American teenage kids to hang out in Juarez. Compared to now, Juarez in the 1980s was innocent fun. By the mid 1990s the drug cartel wars were in full swing. So were more disturbing and unexplained acts of violence. In 1994, I was working in local TV news in El Paso when the bodies of brutally murdered young women started appearing in the deserts outside of Juarez. First a few, then a dozen, then hundreds. Las muertas de Juarez (the dead women of Juarez) they are called. In the summer of 1995, I walked into a field of desert scrub where the decomposing bodies of several women lay. The smell was overpowering. There were no police lines in Juarez so I found myself accidentally walking all over a crime scene. It would be years, not until my time covering the war in Iraq, before I would see horror like that again. Those murders remain a mystery. And now murder is so common that its hard to tell if it’s just drug cartel violence. That would be the most comforting explanation. The cities descent into chaos has be hard on my parents. They used to love spending a Saturday or Sunday afternoon in Juarez. Enjoying a flavor of life you just don’t get in the States. Terrific shopping and great restaurants with the service and feel of a by-gone era. I live in Los Angeles now and hadn’t been back to Juarez since that summer in 1995. Then a few years ago, while covering a story at Ft. Bliss for CNN, I had a free evening. So I decided to cross the bridge and get a drink at the old Kentucky Club. Years of violence had taken its toll. Avenida De Juarez was empty, no drunk teenagers, no GI’s. Most of the clubs from those high school days, including the Derby, were out of business. But the Kentucky was still there in all its shabby glory. The bar was empty save a few old vaqueros quietly sipping beer. I took a seat, ordered a couple of Bohemia’s and thought about all the history in that old speakeasy. There wasn’t much else for me to do, so I walked back across the empty bridge to El Paso. Juarez is a city I both loved and hated. It was connected to El Paso as much as any two cities could be, with the free flow of commerce and people. Overtime the border became a more defined line. Eventually that line became walled. Those walls have made the business of trying to get through them very lucrative, and very dangerous. Now, more El Pasoans than ever won’t go to Juarez anymore. I just recently visited El Paso and Juarez in 10/08. My boyfriend is from there and has not lived there in years, but some of his family lives there. We visited Juarez a couple of times and I never felt that my life was in danger. However, I was the only American that I saw there and received many strange looks. The locals probably thought I was crazy for being there. I guess I just did not realize what could have happened to me. Most of the city looks like a ghost town. People really don't come out after dark. Alot of the businesses have been burned by cartels and most people try to make a living by being street vendors. Anyway, I truly believe that the US has to do something. We are pretty much the reason there are the cartels. Where do you think the drugs are going? I don't know what the answer is but we should not turn our heads. Why do help those who don't want it and dont' help the ones that do? There are many US citizens that are losing friends and family in Mexico. How many more have to die? Mexico is a lost cause...The U.S army should invade and pacify that corrupt murder ridden country. El Chuco will always be home. Violence has brought down Juarez, our memories of good old times will remain with us. Reality is…Juarez will never be the same. Like your self, I’m a native of El Chuco and miss it with every bit of my soul. Crossing el Puente de Ysleta was a daily ritual with my Welita. Every Saturday morning we took the rutera to 16 de Septiembre holding on to her hand with the tightest grip. At 12, I was scared as hell to get on the ruteras but I held on because I knew we where heading to see my tia’s, tios, and primos. I was scared.... because that’s when Las Muertas de Juarez started to hit the media. p.s. You made miss CHICOS! Great article. Yeah, I too was there during the mid '80's. Juarez has changed! It saddens me to see the wall and the destruction of a manufacturing city Juarez was known for. What a sad day and age we live in. I can totally relate to the article. I too was raised 20 miles out of El Paso in a small town half in New Mexico half in Texas (Anthony). I remember all the great times we had in Juarez. The every Saturday trips to Juarez with my family that we always looked forward to as kids. I always wanted to take my teenage girls back and let them see where I once had my good times as a teenager (that won't happen anytime soon). It just saddens me that today, all the killings, drugs and corruption is going on. Hopefully soon, all this will be controlled, and come to an end. JC If you lived next to Juarez, you wouldn't even be saying that. The infiltration of drug money into every level of society has corrupted that country. No one has any idea who is trustworthy. The crime is equal to what we read about in Iraq. El Paso is truly one of the safest cities thanks to our police, sheriff, DEA, Border Patrol and FBI. I greatly appreciate the dedication and honesty of these men and women that protect our city on a daily basis and keep us insulated from what is happening just steps, yet worlds away, from our homes and businesses. Gabe's memories of Juarez in the '80s are very similar to my own. I have not visited our sister city in at least 5 years now. However I pray for my friends that work at the maquilladoras and cross the international bridges every day to go to work. We still have hopes that the twin plants will bring more and more jobs to Mexico and bring more citizens of Mexico closer to a middle class. The drug czar's definitely want to keep Mexico as a 3rd world country that they can control. America has to long been complicite in whats taking place down south,this goes back, for a long time, its been waiting to erupt, remember the movie 'CLEAR AND PRESENT DANGER", this was real, now it's crystal clear, just how determined the cartel's are,too sell their drugs,corruption was allowed to fester , while some made money, and kept their hands, supposedly clean, no not little people, BIG people, because of that greed, now people are losing their lives.Recently I was told in SanAntonio, that if I wanted to buy leather, not to go across the boarder, go to the flee market, it was to dangerous, so that was that, forget the leather. We have ex presidents to blame for some of this, and truth be told , they will never be held to account. My sister lives in El Paso and has for most of her life. The short trip across the border to the Mercado Juarez has been a part of every trip to see her so it's unfortunate that has to end. As a "gringo" with no hispanic background, Juarez was always an adventure into another culture and had the perception of being safe. Reports of bodies in the streets and drive-by shootings has shattered that perception. Let's hope that with better security efforts some of the "old" Juarez can yet return. Maybe 8,000 troops and state police can make a real difference; however, the ingrained corruption and demand for illegal drugs make real and lasting change a difficult goal. Hopefully not impossible. I read with interest your thoughts of the old stomping ground. I can almost smell the smoke machine and hear the clinking of 25-cent "shooters" now. Sigh. We will never see that again. Now as a news person myself, I struggle with the idea of covering this violence. How will we will do it if the city sees another revolution?! It's too dangerous to keep a team there. Will we have to revert to the way it was 100 years ago and watch the fighting from Scenic Drive? I'm sure citizen journalists will help but at some point, the American media (more to the point, El Paso media) will be faced with having to cover a Bosnia-like situation without stepping foot in Bosnia. I'm not sure how that will play out. At any rate, I liked your article. And hope you can tell readers more of our once forbidden playground – not so that people will want to go back to Juarez but so that they can remember what Juarez once was. JC, I don't think anything could be farther from the truth. We're talking about a nearly failed state in Mexico: people disappearing without notice, murders in the streets on a daily basis, police chiefs resigning to protect the lives of their officers, to name a few examples. Blanket statements like yours have no place in discourse. JC would you rather live in LA or Juarez? PS Great article Gabe. I fondly remember my nights in Juarez. ; I just can't remember too many details. You article sure sparked some memories! I, like yourself, was raised in El Paso, attended Eastwood High (Class of '70), frequented Juarez and the Kentucky Club and JUST after graduating high school, got out of "Dodge" and moved to Los Angeles. Your comment about the barber shop almost brought back the sting of the blue alcohol being splashed on my neck and hairline after the barber trimmed with a straight razor. Those trips across every two weeks with my Dad and brothers for a 50 cent haircut and a tank full of Pemex aren't forgotten. The trip back across to El Paso and a double order @ Chico's completed the outing. It's a shame that there is a "war" on drugs. Look at the crime it generates! Gabe, first off very good article. Fellow transplant from El Paso and have to agree with you on the situation going on in Juarez. I was also one of those teenagers drinking the night away the Derby. Last my wife (she is also from El Paso) and I went back to visit and crossed over just for old time sake. Man first thing we saw were the soldiers with automatic weapons. That's when we knew that Juarez was not the same Juarez we knew. I can relate to this article, I attended Gadsden High. Juarez was the happening place, a fun place to go to and hangout. Not anymore of course. But I do hope everything goes back to normal the way its use to be for the sake of all the people in juarez and of course perhaps maybe one of these days I will be able to go back and visit and reminisce of all the good times i had there..
Nostalgic indeed, If you think about the past and those days will never come back. The world is becoming a very serious and dangerous place. This consumed soo many innocent lives. Looks like we need to live the moment, we really dont know what tomorrow is going to bring.